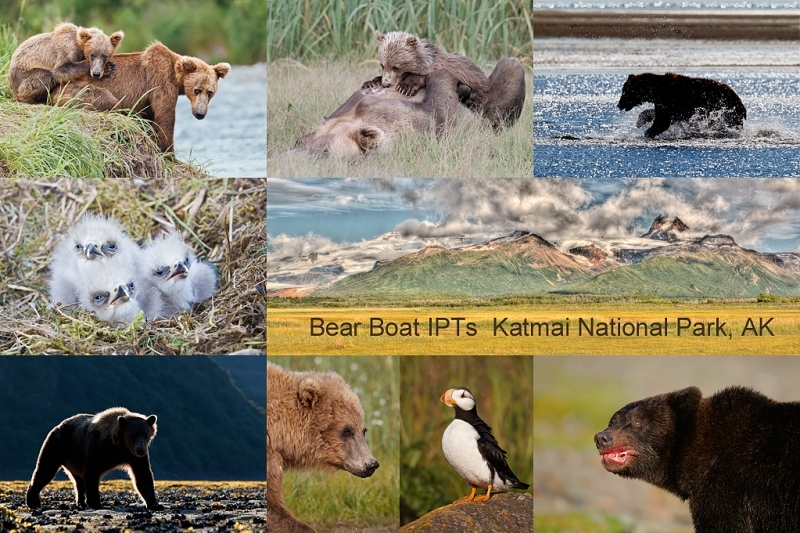 Do consider joining me next summer for a surreal experience: creating intimate photographs of these incredible bears. Happy campers only please! Coastal Brown Bears at point blank range foraging & clamming with a good chance of copulations; cubs nursing and playing. Likely additional subjects include Horned and Tufted Puffins, nesting Bald Eagle and Black-legged Kittiwake, Steller’s Sea Lion, rafts of Sea Otters and more. Halibut fishing optional. Robert O’Toole will be co-leading this trip which needs a minimum of five participants to run. Please do not purchase your plane tickets until advised to do so. These always sell out but it is better to be up front and safe. (It is mandatory that you be in Kodiak no later than the late afternoon of July 23 to avoid missing the float plane(s) to the boat on the morning of July 24th. (With air travel in AK being what it is, and with the chance of fog or other bad weather–being on Kodiak on July 22 is an even better plan). We will take you out to dinner in Kodiak on the evening of July 23rd. Jim Heupel is already on board for his third Bear Boat trip. Our plan is to take one or more float planes to the boat mid-morning on July 24th. We will–weather permitting–photograph bears that afternoon and for the next six days. There will be lots and lots of coastal Brown Bears of various ages including spring cubs (nursing and playing), bears eating luscious green grasses, bears clamming, and possibly catching a few early salmon. Bald Eagles with tiny chicks in the nest are possible, as are both puffin species. We should get to photograph at least one Black-legged Kittiwake colony and some hauled out Steller’s Sea Lions (an endangered species). Halibut fishing (license required) is optional. We may, depending on the weather, be able to cross the Shelikoff Strait on the evening of July 30 and spend our last morning photographing rafts of Sea Otters. If this does not pan out, we will not get to photograph the otters and you will incur the cost of taking float planes back to Kodiak. But the plan is to cross and spend a morning with the otters. This is an 8-DAY seven NIGHTS on the boat trip. The eight days will consist of two half days (July 24 and 31 and six full days (July 25, 26, 27, 28, 29, & 30) of photography featuring lots of Coastal Brown Bears as above plus a variety of other natural history subjects plus some nice scenic photography that I forgot to mention above. As noted above, we hope to do the sea otters on that last morning. What’s included? 8 DAYs/7 NIGHTS on the boat as above. All meals on the boat. (The food is amazing.) Bear Guide services. National Park fees. One night’s double occupancy lodging on Kodiak; arrive: July 23/depart: July 24. The thank-you-in-advance dinner on the 23rd and the motel breakfast on the 24th. In-the-field photo tips, instruction, and guidance. An insight into the minds of two tops professionals; we will constantly let you know what we are thinking, what we are doing, and why we are doing it. Small group image review, image sharing, and Photoshop instruction on the boat. What’s not included: Your round trip airfare to and from Kodiak, AK (almost surely through Anchorage). All necessary lodging other than the cost of your double occupancy room on the night of July 23rd. We will let you know the cost of a single supplement if so desired. And we will arrange for a room on Kodiak for you on the night of the 22nd if you opt to arrive a day early as we recommend. The cost of the float plane out to the boat on July 24th and possibly the cost of the return float plane trip on the morning of the 31st if we cannot make the otter crossing on the night of the 30ieth. The suggested crew tip is $200. A $2,000 per person non-refundable deposit by check only made out to “Arthur Morris” is required to hold your spot. Please click here to read our deposit and cancellation policies. Then please print, read, and sign the necessary paperwork here and send it to us with your deposit check. Deposits are due immediately. This leaves a balance of $4499. The first payment of $2499 is due January 24, 2012. The final payment of $2000 is due on March 24, 2011. Please remember that we need five deposits in hand to run this trip so please do not purchase your plane tickets or use your air miles until you learn from us that we are good to go. We will likely know for sure no later than December 15, 2011.